This cleansing bar combines the greenest of green ingredients to cleanse and nourish your face and neck gently and leave your skin soft and gorgeous. 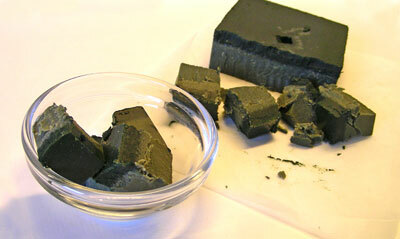 The dark green color of spirulina makes green clay look positively pale! 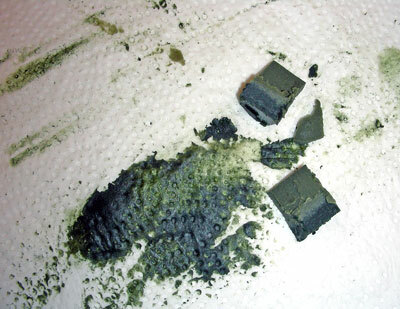 Spirulina (INCI: Spirulina Maxima) is a microscopic blue-green algae that belongs to the Cyanophyceae family. It is naturally rich in amino acids (over 70% of its dried matter is protein) and carries a healthy dose of vitamins A and E as well. These combined nutrients help protect the skins collagen (read: assists in keeping wrinkles at bay) as well as feeding the hair (some say its keratin-strengthening powers are awesome - I haven't checked this bit of info in detail yet). 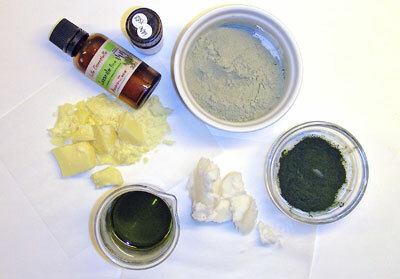 Spirulina is a wonderful ingredient in masks and creams, as well as hair and nail-strengthening products. Here's where I bought mine. Always melt slowly over low heat and always start with the butter that has the highest melting point (in this case, cocoa butter). 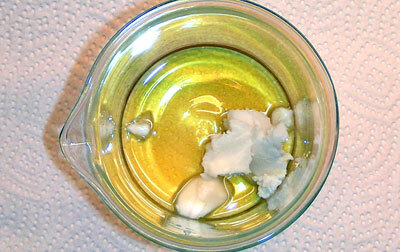 As soon as the cocoa butter is melted, remove from heat and add the shea. Stir until dissolved. I split the oil mixture into 2 beakers because I wanted to layer this bar. This was purely for fun. It works just as well if everything is mixed together. 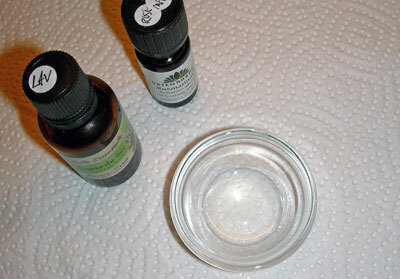 Any time you want to add a mix of essential oils to a product, start by 'introducing' the oils to each other in a small separate bowl. Let your blend sit for a moment, then hold the bowl in the palm of your hand and briefly swirl it around. The heat from your hand and the gentle agitation helps maximize the synergistic properties (and combined scent) of the oils (read: gives you max bang for your buck). For this bar, I used 5 drops of each essential oil. The oils are added to the clay mixture, then given a proper stirring. 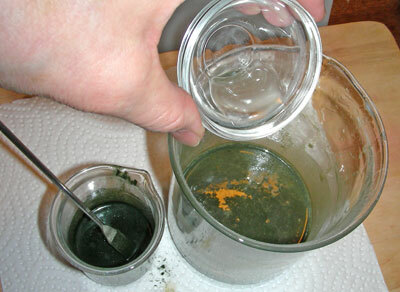 To make the layered effect, I started with the green clay mixture, then added the spirulina mixture immediately. Spirulina is more lightweight and 'stays on top' ever so nicely. Let set for a few hours and carefully unmold. Storage: I know I'm repeating myself but this is important. Because there are no preservatives in this bar, you have to keep it dry and store it in the refrigerator when not in use. (I usually wrap mine in a paper towel then in a zip-locking plastic bag so it doesn't take on or give off any scent to other things in the fridge). For ease of use, slice off portion-sized bits and just grab one when needed. Additional uses for cleansing bar pieces: abstract paper towel art. 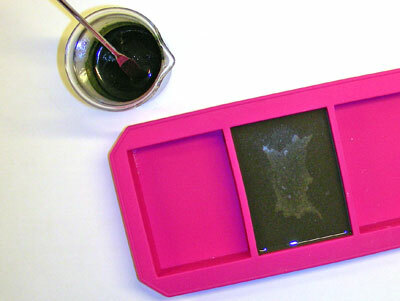 This piece is titled Spirulina and Green Clay Cleansing Bar on Paper Towel. For a step by step description of how to use as a face and/or hair cleanser, please check this post. Hi Lola - I totally thought of you and hair care while working on this one. 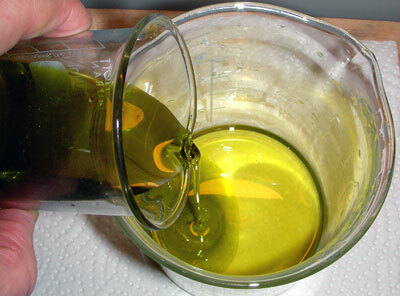 Yes, I can see that working VERY well for curls-- the hempseed oil.. the spirulina... it's curl-loving joy! 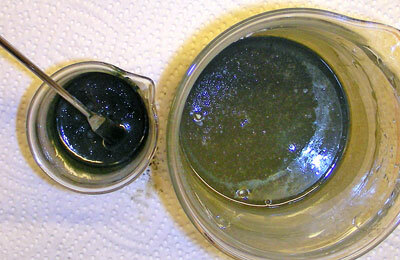 As for using spirulina in a mask- mais oui - as the clever French that also use this for masks say. :) Enjoy! I made this and it just turns everything green. DARK green! Im not sure how its supposed to work but I wouldnt call it a cleansing bar. I wish I could see yours compared to mine. Hi anonymous, this is indeed a bar that brings a bright green color upon application, but it does cleanse. The pictured bar s the one I made. To avoid too much coloration you could try applying prior to taking a shower, or perhaps remove the bulk of the bar with moistened cotton rounds before rinsing the remainder off. 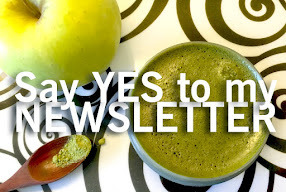 Spirulina adds a LOT of color but it also has a lot to offer skin. If you like the way it works but want less mess, try the oatmeal bars. These are very neutral in color. Hope this helps! hi, thanks so much for this, i drink spirulina and have seen the benefits of it, i would love to make this, but question is where do you buy your ingredients you listed, im in the USA , also i have a tree nut allergy, so i have to make sure the oils are pure and not adulterated, (once i brought olive oil from newdirectionaromatics.com, and it put me in the hospital, i believe it was mixed with hazelnut oil+olive oil and not listed as that because no fda requirements) anyways i cant use shea butter , so any alternatives you recommend. Hi Kawal - thanks for your comments. I buy my spirulina from a French company called Aroma Zone. Find a link to them under the links section. As for replacing the butter, how would mango butter work for you? 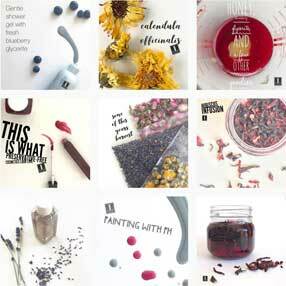 In the US, you may give Rose Mountain Herbs a look for ingredients. I am not familiar with all of their products (as I am on the European side of the pond), but I've seen many soapmakers recommend them. Good luck with it, and do let me know how it turns out! Hi Lise! Can the cleansing bar be used all over the body as well? If so, how would you recommend storing them in the shower? Does that go for the other cleansing bar recipes you have listed on your site? Hey there! Yes, you can use these bars all over the body as well, but I can't recommend storing them in the shower. There are no preservatives in these bars so they need to be stored DRY. Check the FAQ page for more about storage. Note that these bars contain nothing that will foam up or give you anything even slightly resembling the feeling of soap. Yes, you can use any of the bars on the body. I'd probably go real easy on any heavily colored clays and other ingredients (like spirulina) for all over body use - otherwise you may well find yourself in need of cleaning the shower area afterwards! 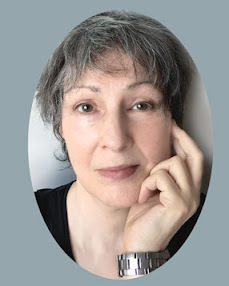 Hello, Lise, great blog, thanks for letting learn. 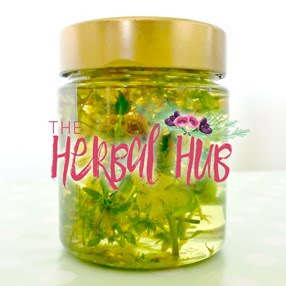 Can I use a different oil instead of hempseed? love the colors and looks- can it be used on face?